Session on Geo-Political Dynamics: Egypt and North Africa with Ms. Ellen Laipson, Dr. William Lawrence, Dr. Dirk Vandewalle, Dr. Paul Sullivan, and Dr. Abderrahim Foukara from the National Council on U.S.-Arab Relations’ 24th Annual Arab-US Policymakers’ Conference, “U.S.-Arab Relations at a Crossroads: What Paths Forward?,” on October 15, 2015, in Washington, DC. 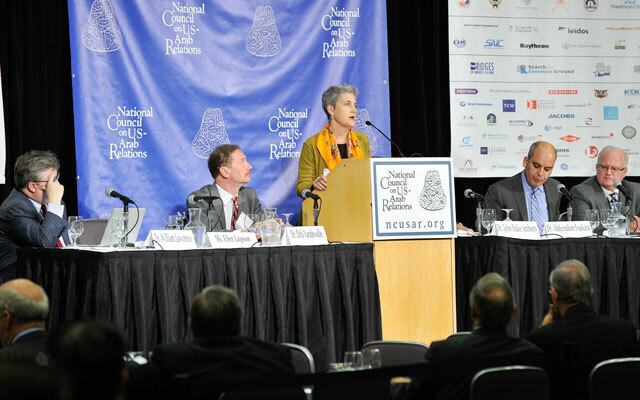 The National Council on U.S.-Arab Relations’ 23rd Annual Arab U.S.-Policymakers Conference included a session on “Geo-Political Dynamics: Egypt & Arab North Africa” that featured Dr. Paul Sullivan, Dr. Michele Dunne, Ms. Ellen Laipson, Dr. Michael Hudson, and Dr. William Lawrence. Ms. Elizabeth Wossen – Principal and Lead Consultant, Energy Links Group LLC; former Coordinator, Congressional and Government Relations, Kuwait Petroleum Corporation; Member, Board of Directors, National Council on U.S.-Arab Relations. Dr. Paul Sullivan – Professor of Economics, Eisenhower School, National Defense University; Adjunct Professor, Security Studies, Georgetown University; Columnist, Turkiye Gazetesi, Istanbul, Turkey. Mr. Karim Haggag – Visiting Professor, Near East South Asia Center for Strategic Studies, National Defense University; former Director, Egyptian Press and Information Office in Washington, DC. Ms. Alexis Arieff – Analyst on Africa and the Maghreb, Congressional Research Service, Library of Congress. H.E. Ambassador Mohamed M. Tawfik – Ambassador of Egypt to the United States. Dr. Nejib Ayachi – Founder and President, Maghreb Center. Mr. Christopher Blanchard – Middle East Policy Analyst, Congressional Research Service, Library of Congress. H.E. Ambassador Ali Aujali – Ambassador of Libya to the United States. Dr. David Ottaway – Senior Scholar, Woodrow Wilson Center; former Washington Post foreign correspondent in the Middle East, Africa, and Southern Europe; author, The King’s Messenger: Prince Bandar bin Sultan and America’s Tangled Relationship with Saudi Arabia. Dr. Néjib Ayachi – Founder and President, Maghreb Center. Ms. Jennifer Salan – Senior Producer, The Stream, Al Jazeera English. National Council President & CEO Dr. John Duke Anthony joined Dr. Mark Long, Director of Middle East Studies and Associate Professor at Baylor University, as the featured speakers at Missouri Southern State University’s 2011 Gockel International Symposium in September. The symposium focused on “Charting a New Course for Egypt.” Audio and video from the September 22 morning discussion with Dr. Anthony (“The Changing Nature of America’s Interests in Egypt: Implications for U.S. Policies”) and from the September 22 evening discussion with both Dr. Long (“If We Turn Our Backs”) and Dr. Anthony (“Egypt in Regional and World Affairs: Dynamics of Convergence and Divergence”) is available from the Council through iTunes and other podcast services as well here. Speaker: Mr. Amr Ahmed Ramadan – Deputy Chief of Mission and Minister Plenipotentiary, Embassy of the Arab Republic of Egypt; former Trade Negotiator at the Permanent Mission of Geneva (1999-2004); former Director of three divisions at the Egyptian Ministry of Foreign Affairs – the International Economic Relations Division, the United Nations Division, and the Arab Levant Division. Egypt And America: Free At Last?